If it’s wild animal spotting you’re after, you’re not going to get much better than the wildlife spotting in Africa. Lions, zebra, elephants, leopards, cheetahs, even gorillas, to name but a few, and all in their natural habitat. London Zoo, this ain’t. If you can only visit Africa for a short time, no problem: choose a region and head to its wildlife hotspot! If you’re doing a bit of an epic trip, lucky you: wild animal spotting opportunities are around every corner. So raise your hand and get ready to give Africa’s wildlife a massive HIGH FIVE! If you’ve been to Africa, share your own animal encounter in the comments thread below. Before we start, remember that you can fly to Africa with STA Travel from a bargainous £368. Right, let’s start the countdown! Southwestern Africa is a wildlife hub. Take the Etohsa National Park in Namibia. It’s home to 114 species of mammals, 240 types of bird, 110 different species of reptiles… and 1 species of fish (weird). Then mosey on over to the Okavango Delta in Botswana, where you can expect to spot lions, elephants and and crocodiles, to name just a few, in this labyrinth of lagoons, lakes and islets. Lions and zebra and wildebeest, oh my! The world famous Serengeti National Park in Tanzania is world famous for a reason. Firstly, it’s home to the biggest population of lions in Africa. Secondly, between July – October each year, over 1.7 million wildebeest and a quarter of a million zebra migrate from Serengeti down to the Masai Mara in Kenya. “Incredibly awesome” would be an understatement. You want lions? You want elephants? You want leopards? Throw in some rhinos and buffalo, and you’ve got the Big Five – and you’ll find them all in Kenya’s Masai Mara. You can also catch the Great Migration as the wildebeest and zebras make their way down from the Serengeti. 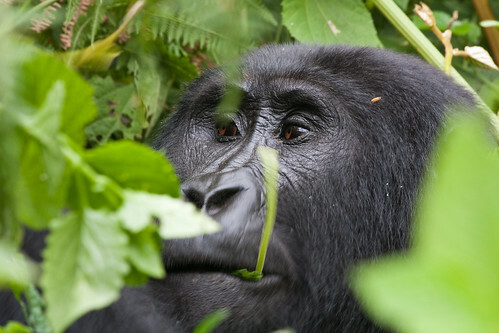 The Bwindi Impenetrable National Park in Uganda is a sanctuary for chimpanzees, colobus monkeys, and half the world’s population of the endangered mountain gorillas. Gorilla trekking is a serious once in a lifetime experience; whether you’re an animal lover or not, I challenge you not to be moved when you see these amazing creatures in their natural habitat. If big furry things are your thing, then head to the Kruger National Park in South Africa. It’s got more species of large mammal than anywhere else in Africa. You might spot the African wild dog – there’s only around 400 left in South Africa, and Kruger is home to packs of them. Fancy visiting any of our African wildlife hotspots? You could even visit them all on an epic overland trip in Africa! For more information, get in touch with one of our Travel Experts or pop into one of our stores.